Both phones have a plastic body, lacks fingerprint scanner but comes with Face Unlock Support. Redmi 6A has a 5.45-inch (1440 x 720 pixels) 18:9 FullView Display compared to 6.2-inch HD+ 19:9 Notch Display. Redmi 6A is powered by Quad-Core MediaTek Helio A22 12nm processor with 2GB RAM and 16/32GB of internal storage whereas Realme C1 has Snapdragon 450 processor with 2GB RAM and 16GB storage both phones have dedicated MicroSD card slot, Support for Dual VoLTE. The performance will be better on Realme C1. 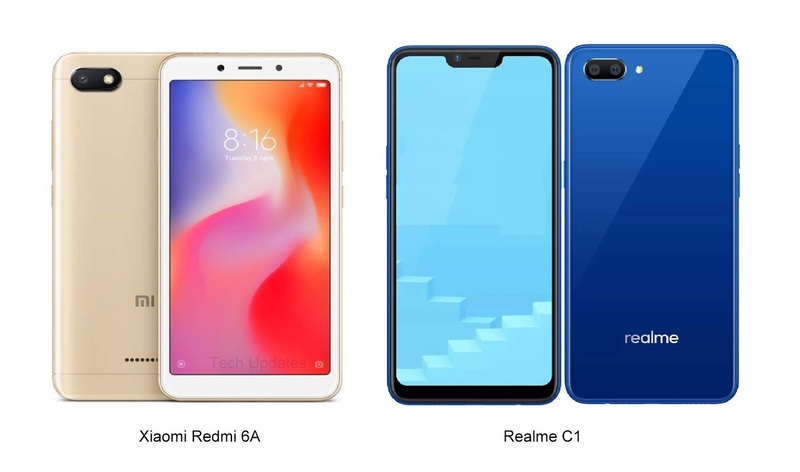 In terms of Camera, Redmi 6A has a 13MP rear camera with LED Flash whereas Realme C1 has a 13MP rear camera with LED flash, f/2.2 aperture, secondary 2MP camera with a f/2.4 aperture both phones come with 5MP front-facing camera. Both phones can record 1080P videos. Redmi 6A runs on Android 8.1 (Oreo) with MIUI 10 whereas Realme C1 comes with ColorOS 5.1 based on Android 8.1 (Oreo). MIUI is more optimized compared to colorOS. Redmi 6A has 3000mAh battery compared to Realme C1 which has 4230mAh Battery. Xiaomi Redmi 6A comes in Grey, Blue, Gold and Rose Gold colors, is priced at Rs. 5999 for the 2GB RAM with 16GB storage version and the 32GB storage version of it costs Rs. 6999. Realme C1 comes with Blue and Black color priced at Rs 6999. Realme C1 has Notch Display, Better processor, Bigger battery.